Pre-heat oven to 450ºF. Prepare a mini muffin pan or poover tin by spraying each cup with nonstick cooking spray and dropping a small dollop of melted butter into each one. In a medium mixing bowl whisk together the flour, thyme, salt, pepper and cheese. In a blender, process the milk and eggs until combined. Add the dry ingredients to the blender and process until the batter is smooth, about 2 minutes. Divide the batter evenly between the cups, filling them up about halfway. 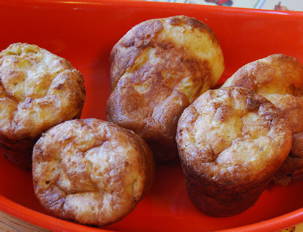 Bake the cups until puffed and deep golden brown, about 20 minutes. Cool the popovers briefly in the pan then remove them while still rather hot. Serve warm. In Recipes-list.com we have selected the most viewed recipes from category - uncategorized . Enjoy the best recipes specially selected for you! Fancy French Cheese Puff Fake-Out is the right choice that will satisfy all your claims.